Mountain Springs Lake Cabin Rentals - Tannersville, PA Lakeside Cottages - 2 and 3 bedrooms on 76 acre lake with Fireplaces and completely equipped kitchens. Cottages in the woods are also available. Swim at a beach on the lake, boats available at the resort, fishing (PA licenses available), tennis courts, hike in miles of woods on Camelback Mountain, cross-country skiing at the resort and in the nearby 3500 acres of state lands. Camelback 5 miles, Shawnee 10, Jack Frost about 20, Camelbeach Summer waterpark with 22 slides down the mountain, 30 golf courses within 30 minutes, horseback riding 7 miles, Mt Airy Casino and the Crossings Outlet Complex is less than 6 miles away. 25 restaurants within 5 miles from a Friendly's to 4 star romantic dining. Unique mountain style vacation homes that are very well kept (Some have Corian counter tops, and stone fireplaces.) and linens are provided. 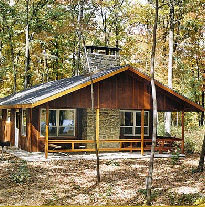 Martinville Cottages and Cabin Rentals Canadensis, PA - Immaculate cottages, cabins and suites in a rustic brook side setting. (You'll HEAR the stream outside the window) Outdoor pool, pond for paddle boating and fishing. 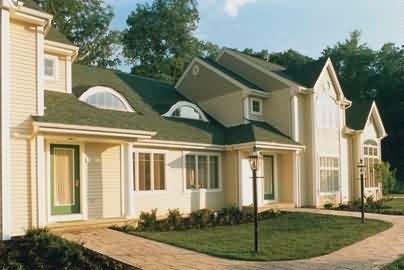 Near restaurants, skiing, hiking, fishing, mini golf, the Pocono Playhouse and many Poconos Activities. Staying here is like having your own rustic vacation home (cabin) in the woods along side a beautiful stream. Private wrap around decks with barbecues over the water. Fully equipped kitchens with utensils, microwaves and coffee makers. Linens and towels included. Townhomes For Rent at Shawnee Resort - Shawnee-on-Delaware, PA have 2 bedrooms and two baths and sleep up to 8, near Shawnee ski area and Shawnee golf course. 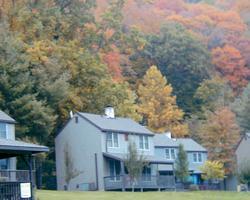 A family resort nestled along the Delaware River adjacent to the 70,000 acre Delaware Water Gap National Park. Jacuzzi in bath in some units. (Not guaranteed). Indoor and outdoor pools, outdoor tennis court, recreation building with snack bar, basketball court (indoors), fitness center, game rooms, basketball courts, children's play areas, fishing, skiing, snow tubing, mountain biking, and hiking. Surrounded by the Poconos Mountains, this lakeside resort is a 5-minute walk from the Camelback Ski Area and Water Park. It features indoor and outdoor pools along with on-site dining. Free Wi-Fi and cable TV are included in the rooms at The Chateau Resort and Conference Center. A coffee maker and work desk are provided. Guests can relax in The Chateau�s whirlpool and sauna. The gym overlooks the indoor pool and is equipped with cardio machines and a mounted TV. American cuisine is served at the Mountainview Bar and Grille, open for breakfast and dinner. A selection of cocktails and wines is available. Big Pocono State Park is within a 10-minute drive of the Tannersville Chateau Resort. The center of Tannersville is 3.5 miles from the property. Why Choose Poconos Rentals Reservations? For Poconos Mountain Overnight Rentals you've found the perfect website! Whether you're off for family vacations, romantic getaways, or reunions of any type, Poconos Rentals has lodging accommodations and numerous amenities to make your vacation a memorable experience. With accommodations featuring one, two, three and four bedrooms, with or without lofts, wood burning fireplaces, TV/VCRs, full kitchens and private balconies, many with mountain views, you're sure to enjoy the comfort offered by these Poconos Rental Homes. Every overnight Poconos vacation rental has its own spectacular view and access to some resort amenities including a picnic pavilion, tennis courts, family playground, indoor or outdoor swimming pool, sauna, game room with video and book library, and a deck. If you should decide to venture outside the resort, you'll find that the Poconos Mountains recreational activities are unmatched in vacation destinations, Camelback, Jack Frost, Blue Mountain and Shawnee ski resorts provide plentiful winter activities. Camelbeach, and Split Rock each have waterparks, there are hundreds of miles of hiking and biking trails, Paintball, fishing, boating, canoeing, kayaking, animal and snake farm attractions and much much more. 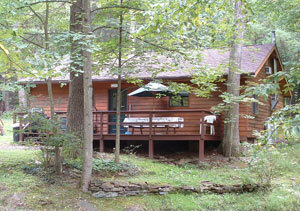 These Rentals include Poconos House Rental packages, and Cottages in the Poconos. Here is where you will find a cabin the Poconos or a the house for rent in the Poconos.